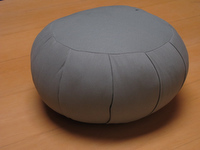 Store > Meditation Accessories > Zafu Meditation Cushion. In multiple colors. Pariyatti stocks buckwheat-filled Zafu Meditation Cushions in two colors: sage and navy blue. We have them for sale in our store in Onalaska, WA, USA, but we no longer ship them. Zafu Meditation Cushions may be ordered for delivery directly from the manufacturer, where they are available in multiple colors and with two types of stuffing (buckwheat hulls and kapok).